"Even in the worldwide capital of innovation, many suffer from lack of access to basic resources," said Cassandra Staff, chief operating officer of Miller Center. The San Francisco Bay Area GSBI Boost is a free, three-day, workshop for up to 40 social entrepreneurs "who are positively impacting the lives of those in need in the San Francisco Bay Area." The workshop will focus on strategic thinking, business plans, growth and long-term financial sustainability. Plus, attendees will also have the opportunity to attend networking events. "Not only will these leaders work directly with Silicon Valley mentors," said Gregory R. Kepferle, CEO of Catholic Charities of Santa Clara County, "they will have a rare chance to collaborate with and learn from other leaders who are working to create innovative solutions to poverty in our area." Catholic Charities of Santa Clara County has deep rooted connections from its 12 years of working on this issue in the Bay Area. Kepferle wants to use these relationships to encourage organizations to get involved and ultimately help new groups. "We believe that with their [Miller Center] global expertise and our connections to the local community that we could spark, hopefully, a revolution here locally," Kepferle said. Organizations can be for-profit, nonprofit or a hybrid and do not have to be affiliated with the Catholic Church. The main requirement is that the organization focuses on solutions that impact "vulnerable, low-income and/or underserved populations." After the event, the pilot program will continue for up to 20 organizations by extending its participation with a six-month online program to help organizations develop business models and strategies to continue to grow. In addition to the online program, each organization with also be provided with mentors and will have the opportunity to present at an Investor Showcase in Silicon Valley. But, it won't stop in California. If the pilot program succeeds, Kepferle said there are dreams of expanding the program nationally, working with Catholic Charities all over the country. "Just because somebody is poor today, doesn't mean they have to be poor tomorrow," Kepferle said. "Living in poverty, doesn't mean they don’t have ambition and drive. This gives people that opportunity to create work, create income and assets to get out of poverty." Thane Kreiner, executive director of Miller Center, said the Miller Center began thinking about bringing this type of programming to the United States after the 2015 election, when they noticed people were feeling "disenfranchised." "We asked the question of whether or not social entrepreneurial approaches might be a mechanism to heal some of the division in the United States," Kreiner said. And that's how the Miller Center's programing under the umbrella of Social Justice in the United States got started, he said. The Miller Center is currently hosting more programs than ever before, Kreiner said. Founded in 1997, it has raised $580 million in investments and helped 259 million people, according to the Miller Center website. Applications are open until June 1, with the program taking place July 24-26, in San Jose, California. The women mostly wearing beautiful, brightly colored traditional gowns were seated quietly beneath white event tents festooned in bright colors surrounding a small plaza that would serve as a stage. An empty tent on a platform was waiting for the VIP guests, including the executives of All Across Africa, the company the women credit with changing their lives. All Across Africa sources handicrafts from here in Rwanda and also from Uganda and Burundi. The women weave baskets. This model would not distinguish All Across Africa from dozens or perhaps hundreds of other social enterprises that buy handicrafts from marginalized communities in emerging markets, but the story doesn’t end there. CEO Greg Stone and COO Alicia Wallace have developed an impressive customer base for their products, including Pro Flowers and Costco. Their portfolio of buyers includes hundreds of independent retailers, allowing them to buy in volumes that are unusual. All Across Africa’s secret sauce is creating contemporary designs that are appealing to Americans that the weavers in Rwanda can produce, rather than simply taking what the women were making and trying to sell it in the U.S. When the company landed Costco in 2009, they had to grow their phalanx of weavers who supply their products from 60 women to over 1,000 in about 90 days. It has continued to grow ever since. Today, about 2,000 of the women were invited from this part of Rwanda to participate in the celebration. At least half showed up. The weavers, primarily women but including a few men, held their annual celebration of the year spent working themselves out of poverty. The event is part annual meeting and includes some ceremony, but is primarily a party to celebrate their shared success. At last year’s event, the weavers presented Greg with a spear and shield as symbols of his battle with their poverty. They recognized that they needed each other to make the climb from the lowest economic rungs to a lifestyle that would include adequate food, shelter and clothing—and dignity. In his remarks, Greg recommitted himself and the company to the fight. All Across Africa exists to fulfill that mission. Selling baskets is simply the vehicle the company uses to achieve that objective. Organized originally as a nonprofit, the company now uses a hybrid model with a for-profit and a nonprofit entity. The for-profit business, All Across Africa, sources and sells baskets and other handicrafts. Opportunity Across Africa, the nonprofit, provides training. The company participated in the Global Social Benefit Institute program at the Miller Center for Social Entrepreneurship at Santa Clara University in 2016. I wrote about the program here. The company has helped the women form and manage co-ops. Technically, the company doesn’t buy products from the weavers; it buys from the co-ops. The co-ops are all independent. They can choose to sell products to other companies and there are several competing for the women’s handicrafts. But, the women say they earn twice as much selling to All Across Africa and so devote the majority of their time to its orders. The income they make is life changing, they say. Typically, before joining the ranks of the All Across Africa weavers, they ate only two meals a day, including a bowl of porridge for breakfast that would have to last a full day of working outside on their farms. Now, they eat three meals a day, pay others to work on their farms and use their profits to acquire more land and animals. The women take pride in being fat, though few would qualify for that label in the U.S. None of the women appeared skinny or undernourished. The income increases their status in the community and at home. The women not only earn greater respect from their neighbors but also from their husbands. They admitted that their husbands were dismissive of their work before All Across Africa but no longer. Many women earn more than their husbands and are now true partners in their marriages. The income is also growing the local economy in unanticipated ways. In addition to using their new wealth to hire farm hands, they also buy sisal, the natural thread they use for weaving the baskets, rather than tediously harvest it themselves as they once did. Each week, the women gather for order days on Monday and Tuesday. A cottage industry of food purveyors has popped up so the woman don’t have to cook or bring lunch. ONE OF THE WEAVERS SHOWS OFF SOME FRESHLY HARVESTED SISAL. At today’s event, in a lengthy pageant-like sketch, the women portrayed the complete cycle of change that All Across Africa brings to their lives. They covered everything from how they were recruited and how skeptical they were about changing their lives by weaving to how to run a co-op, to avoid bad financial decisions—like spending their money on banana beer—and how to save for the future. The presentation ended with the women dancing and proudly holding up their bank books. A local politician was invited to speak. His message, reminding the women to be thrifty and to buy health insurance was at least redundant and perhaps insulting. One of the women leaders, Irene Mujawayezu (her last name means servant of Jesus, one of the staff explained), took the microphone to explain in response that in her co-op, all of the women have their health insurance paid and to otherwise make clear that these women didn’t need a man to tell them how to spend their money. In her remarks today, Alicia invoked a local blessing, “I wish you many cows and much success.” That was also redundant. The women do have many cows and plenty of success. “How Do You Start Charging People You’ve Been Serving For Free?” That’s the question that Brian Iredale, head of Nurture Africa in Kampala, Uganda is asking himself. At the same time, the handwriting is on the wall. To continue serving the people he loves, he must begin charging. Brian came to Uganda in 1997. Seeing the challenges the country he faced, he decided to do something about it. He earned a nursing degree and returned in 2003 to launch a nonprofit that today is called Nurture Africa. He focused on the needs surrounding the community of HIV patients and their families, especially AIDS orphans. In 2009, he left his job as a nurse and began working full time for the organization. Since its founding, Nurture Africa has provided services to its needy clients at no charge. In order to continue serving them, however, Brian has recognized that the organization will need to begin charging fees to make it more financially sustainable. His plan is to begin offering some services to the public at a profit so that it can afford to offer those services at a discount to the needier families. The organization offers microloans to mostly women to help them become more financially independent. For the loans, Nurture Africa has traditionally charged an interest rate of 1 percent per month. Going forward, Brian plans to charge 2.75 percent per month, which is still below the market rate of 3 percent. The loans of up to about $150 are expected to be–and generally are–repaid within six months. Most health services have been offered completely for free. The challenge of charging low-income clients anything will be big. In order to be able to afford to offer the services at a discount in the long run, Brian plans to offer services to the general public, including more affluent customers, at a modest premium to cost to generate cash flow to support the discounts for needier clients. The organization provides a variety of educational programs. As we toured the campus with Brian, we encountered classes going on all over. In one room, HIV-positive women who are pregnant were learning how to deliver a baby without infecting them. Another group was learning about hygiene. In another room, girls were learning how to sew and others were learning how to braid hair. Next door, a group of teens was learning to use Microsft Office on donated computers. One of the students in the computer lab was Latif Sserunjoji. He explained that the students “need I.T. skills for life.” Latif was born after his mother received help from the organization before he was born. Brian recognizes his own need for training at this critical juncture in the organization’s history. He’s enrolled in the Healthymagination Mother and Child program, a social venture accelerator that is a partnership between GE and the Miller Center for Social Entrepreneurship. He will be presenting to a group of donors and investors next week in Nairobi as the culmination of the program. The coaching and mentoring he’s received as part of the program has helped him develop a pitch for the investors and a strategy for shifting from a pure donor-supported model to relying on fees for a substantial portion of the funding. As the tour came to an end, Brian guided the group to a small stage. Some of the students performed a dance for the visitors. Brian noted that some of the kids who were born to HIV-infected women in the earliest days have grown up to become volunteers and even employees of the organization, coming full circle. In a similar way, Brian hopes to master this difficult transition and to have the opportunity to share his insights and lessons learned with others. Joseph participated in the 2016 cohort of the Miller Center’s Global Social Benefit Institute. I covered that for Forbes here. Over the past 20 years, Joseph has been working to implement his vision of the “farmer ownership model” for growing coffee in Uganda. Perhaps because coffee grows easily in Uganda and millions of people grow a little bit of coffee, the power in the coffee industry has been in the hands of the buyers and their agents. Joseph observed that farmers in Uganda did not effectively own their coffee. As evidence, he pointed out that when he asked coffee farmers about the price of coffee, they never seemed to know. When he asked the same farmers, who frequently kept a few chickens, about the price of chicken, they always knew. Put another way, small-holder farmers in Uganda have traditionally been price takers. This provided the basis for organizing farmers into cooperatives to create more balance in the industry so that farmers could negotiate from a position of strength. Today, 198 cooperatives representing 1 million small farmers are members of NUCAFE. Together they produce about $500 million of raw coffee. More recently, Joseph has been working to create more vertical integration so that the farmers can capture more of the value. Ground, roasted coffee sells for about ten times the price of coffee off the tree. The equipment required to remove the coffee bean from the berry is ubiquitous in Uganda, but beans in that condition aren’t ready to be ground and roasted, substantial cleaning, grading, drying and processing is required to get it ready to be roasted and ground. NUCAFE has recently constructed and begun operating only the third coffee processing plant in all of Uganda. Joseph believes that it is the only one in the world that is farmer owned. Now, member farmers can pay a tiny fee to have their beans processed, allowing them to increase their revenue 2.5 fold. NUCAFE also built roasting and grinding capacity at the plant and has begun selling coffee under the brand Omukago, a Lugandan word referring to deep, close friendship akin to family, traditionally expressed with a drop of blood on a coffee bean. Although volumes are relatively modest today, the nearly tenfold difference price allows participating farmers to meaningfully increase their profits even if only a portion of their production. Joseph grew up on a small coffee farm and then attended university to learn how to optimize coffee farming. He realized after completing school that the system was rigged against the farmers and that the industry would have to be restructured to protect the interests of the farmers. His father had 16 children–and two wives–stretching the resources of a small coffee grower. His father was also a primary school teacher and understood the need to make sacrifices to ensure that his children had the opportunity to attend school. That investment is now paying dividends for the millions of people who are now benefiting from his son’s work. 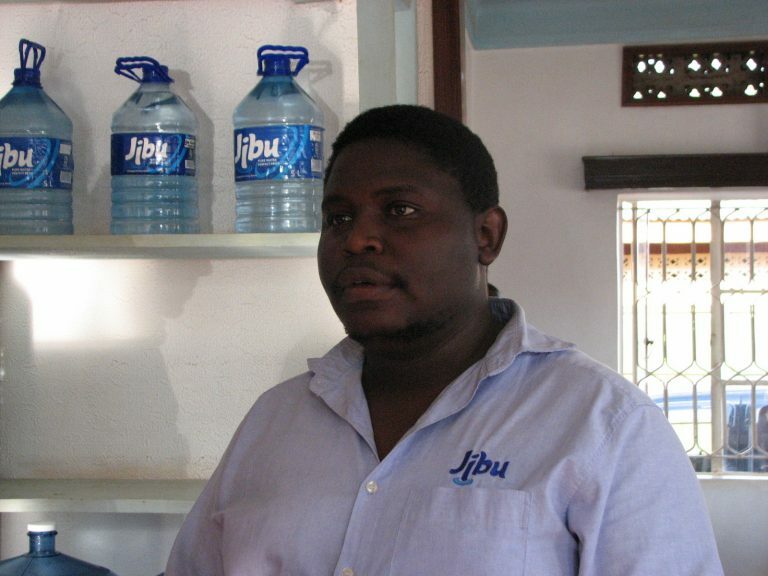 Joseph’s next challenge: grow coffee production in Uganda. NUCAFE has targeted a six-fold increase in national coffee production over the next three years. A government-supported effort to plant millions of coffee plants around the country makes this conceivable. If I learned anything from my visit with Joseph, it would be this: never doubt that one person can change the world. Richard Bbaale was upset that his younger sister could not attend school during her monthly period so he decided to do something about it. After pondering the situation through completing his MBA at Uganda Martyrs University, he launched Bana, a nonprofit social venture to make and sell affordable pads to keep girls in school. Richard wasn’t content to sell affordable pads to keep girls in school, however. He wanted to use the pads to empower women in every way possible. 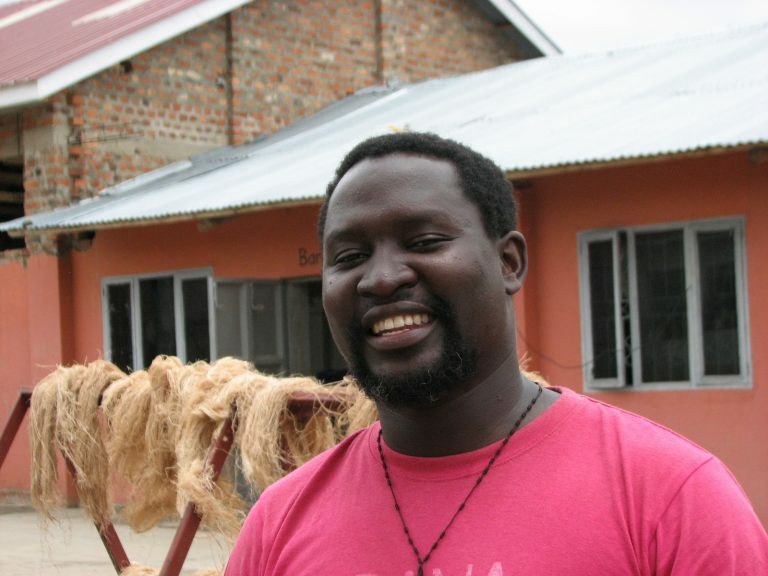 Starting with highly absorbent banana tree fibers, he conceived of an environmentally friendly pad that would be completely biodegradable, especially in Uganda’s ubiquitous pit toilets. Traditionally, the banana tree trunks are simply discarded. He also wanted to create a distribution channel that would empower women so he’s created an Avon-like sales force of “Champions” who sell the pads to their friends and neighbors. The five-year-old s company is changing the lives of these women in dramatic ways. All this was not enough for Richard. He recognized that women could help him with the supply of banana tree fibers. He hires groups of women in villages to harvest the banana tree trunks, break them down and pound them to release the fibers. They then dry them in the sun and sell them to Bana. Most women work part time for about $15 per month, but some work nearly full time and earn about $45. Richard says he’s about to provide the women with equipment that will do much of the hard work of preparing the fiber, allowing them to more than double their production—and their potential incomes. This could allow women who have traditionally earned less than $1 per day to earn $3 or $5 per day. Most of the employees in the production facility are also women. He’s making every effort to see the production and distribution of the pads change the world for as many women as possible. To that end, Richard has established a community health clinic that provides a variety of basic health care functions, including labor and delivery, HIV and STD screening, and immunizations. The clinic also provides health education, helping women to understand their reproductive options. Richard is excited. He is prepared to scale up the production substantially with an infusion of capital. One donor has committed about $750,000 subject to finding another to match that. The capital would principally be used to “industrialize” the production processes in the plant. Richard introduced us to three of the women who provide Bana with banana fibers. Maria Nantubwe is a young-looking grandmother who is a painful reminder of the childhood mortality statistics in Uganda, having lost two of her three children. Today, she makes two kinds of soap to sell to her neighbors and occasionally weaves baskets to sell as well. She also works in the garden, growing food for her family. He devotes about six hours per day pounding banana tree stalks into fibers for Bana. She says, “It is hard work but you get used to it.” She says she likes the work because she gets paid immediately when she delivers a 70-kilo bag of fiber and can produce three per month. 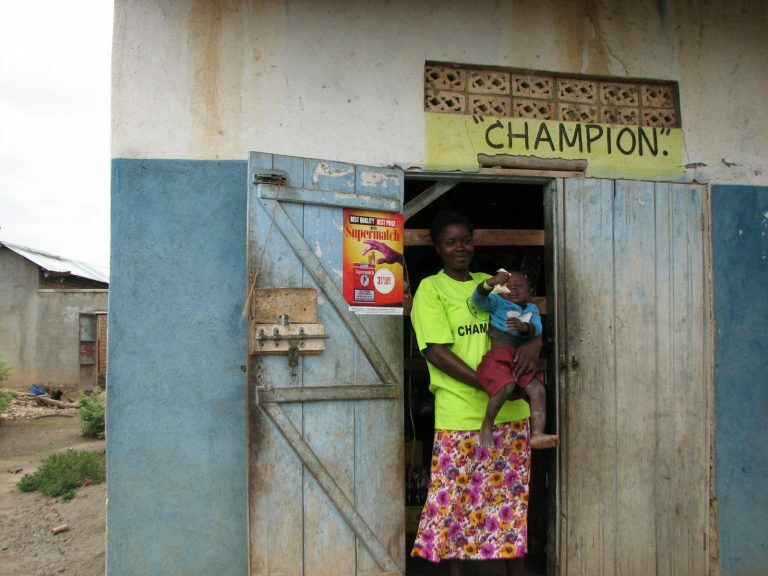 Grace Nalubowa is a 21-year-old mother of one daughter who has been selling Banapads since she was 16 years old. She learned enough about retail sales that she has opened a small retail shop on her family’s property and says she now generates a profit approaching $100 per month. Sylvia Naluyage has been selling for Bana since the company was launched in 2012 and was involved even before that. We visited with her outside of her big new home, about twice the size of the small home where she used to live across the street with her ten children. She practiced her pitch for us, explaining how she always involves a wife’s husband in the sales pitch. She takes credit for the initial sales but notes that the product itself if responsible for resales. Like Fausta, she has built a small network of women from other neighborhoods who act as agents for her. One of the greatest challenges for social entrepreneurs is how to measure and report impact. For help, I asked Thane Kreiner, PhD, executive director of the Miller Center for Social Entrepreneurship at Santa Clara University, a leading expert on social impact. This week, as a guest of the University, I will be traveling with Thane to Uganda, Rwanda and Kenya, visiting some of the social entrepreneurs who have completed the Center’s Global Social Benefit Institute social entrepreneurship accelerator program. Here are the questions I put to Thane and his responses. Impact investors are becoming increasingly sophisticated about measuring impact. What impact measures should social entrepreneurs be prepared to deliver from day 1? It depends on the sector, impact model, and temporal relation between outputs of the social enterprise and impact. In some sectors, impact is much easier to measure than in others because the impact or outcomes are directly or independently caused by outputs. Conversely, when the time between output and impact is long (e.g., years or decades), impact measurement may not be possible at all, much less in a day. Impact measurement can be costly, particularly when many factors in addition to the output of the social enterprise contribute to the impact or when there is temporal separation between output and impact. What impact standards should social entrepreneurs use to frame their impact reports? Social entrepreneurs in almost all sectors should report the number of lives impacted; in doing so, they should explain the theory of change (or logical framework) and provide qualitative examples of what each life impacted means in humanistic terms. Number of jobs or livelihoods created is also an impact reporting standard. Most other impact measures vary by sector or other factors related to the specific form of the impact. For social enterprises serving the poor, economic impact, whether increased income, decreased expenses, or reduction of productivity is a useful measure. While measuring impact should have the effect of improving impact, how does a social entrepreneur avoid burdening the effort with bureaucracy that stifles impact or thwarts economic success? Clear communication among stakeholders is essential when defining the impact model, impact metrics, and impact measurement and evaluation process. Impact investors who demand impact measurement should be prepared to fund it. Social entrepreneurs should be realistic about what can be measured quantitatively (“not everything that counts can be counted” – attributed to Albert Einstein, perhaps erroneously) and what cannot. They should also be cautious about attribution error, as many people and communities served by one social enterprise are served by other means. Founded in 1997, Miller Center for Social Entrepreneurship is one of three Centers of Distinction at Santa Clara University. The centers embody the University’s mission to unite students and faculty with Silicon Valley leaders to address significant public issues. Miller Center accelerates global, innovation-based entrepreneurship in service to humanity. Thane Kreiner, PhD, is Executive Director of the Miller Center for Social Entrepreneurship at Santa Clara University. Thane was previously Founder, President, and CEO of PhyloTech, Inc. (now Second Genome), which conducts comprehensive microbial community analysis for human health applications. He was Founder, President, and CEO of Presage Biosciences, Inc., a Seattle-based company dedicated to bringing better cancer drugs to market. Thane was the start-up President and CEO for iZumi Bio, Inc. (now iPierian), a regenerative medicine venture based on the break-through iPSc (induced pluripotent stem cell) technology. Prior to his efforts as a “parallel entrepreneur”, Thane spent 14 years in various senior leadership roles at Affymetrix, Inc., which pioneered the DNA chip industry. Thane currently serves on the Board of Directors for the BioBricks Foundation and as a Board member for Didimi, Inc.. Thane earned his MBA from the Stanford Graduate School of Business; his Ph.D. in Neurosciences from Stanford University School of Medicine; and his B.S. in Chemistry from the University of Texas, Austin. Since 2011, Ashoka U and the Cordes Foundation have recognized outstanding programmatic innovations that transform how colleges and universities foster changemaking education on campus. This is the only award of its kind, designating premiere innovative programs that advance social impact education. “[Since] 2014, we've seen the first-ever Vatican conferences on impact investing, Catholic Relief Services’ first impact investment, and a growing number of Jesuit and Catholic universities inspired to teach or support social entrepreneurship,” said John Kohler, Miller Center’s director of impact capital. Kohler was among those who has spoken at both Vatican conferences, and has advised CRS and other organizations on how to invest in this innovative way. ”There is an exciting convergence now between Catholic social ministries and the impact investing community toward using capital in new ways to solve entrenched social problems,” he added. Miller Center, which celebrates its 20th anniversary this year, has provided free training and mentoring to more than 600 social enterprises around the globe, and continues to evolve. After spending time reflecting on the most pressing problems facing impoverished countries today, the center's staff have affirmed their primary goal to eradicate poverty through social entrepreneurship, and focused the center's resources on two main areas: “women rising” and climate resilience. Miller Center is now selecting social enterprises for its Global Social Benefit Institute (R) programs that are led by women (or addressing issues that affect women), or engaged in promoting resilience to the effects of climate change, particularly those addressing energy and water poverty, sustainable rural development, or health. • Pollinate Energy trains local entrepreneurs to establish micro-businesses that sell clean solar lights, water filters, and solar fans in urban slums of India. After participating in the center’s GSBI Accelerator in 2016, Pollinate Energy received a $100,000 grant from a Silicon Valley-based global venture philanthropy firm. In addition to easing women’s household tasks and replacing toxic kerosene in the home, the company provides employment, increased education for students, and greater discretionary income by eliminating fuel costs. • Koe Koe Tech, which provides essential health information to parents and pregnant women (in order to reduce maternal and under-5 mortality rates in Myanmar), recently received a $150,000 USAID grant. • Livelyhoods, which trains women and youth in Kenyan slum areas to sell environmentally beneficial products like clean cook-stoves and solar goods, recently received $100,000 from investors. Kreiner said, “Scientific data overwhelmingly indicate that climate change driven by fossil fuel emissions is stressing our planet’s ecosystems, imperiling the lives and livelihoods of billions of people. The social enterprises Miller Center supports – and their innovations – are more important now than ever." DR. HALL TEACHING IN THE CENTRAL MEXICAN CITY OF SAN MIGUEL DE ALLENDE, WHERE PACE MD CO-SPONSORED AN ADVANCED LIFE SUPPORT FOR OBSTETRICS WORKSHOP. ACE MD also started a program — PACE Corps — that complements medical students' classroom learning with practical fieldwork. This program is designed in the spirit of the Miller Center's Global Social Benefit Institute fellowship, in which Santa Clara University undergraduates conduct field research with social enterprises in developing countries. Last year, PACE Corps medical student volunteers spent several weeks in Chiapas, one of the poorest states in Mexico, providing ALSO training for nurses and midwives. Jesus "Chuy" Noguez Vega, currently in his last year of medical school, had his PACE Corps presentations translated from Spanish into two indigenous languages so that they would be more widely understood. 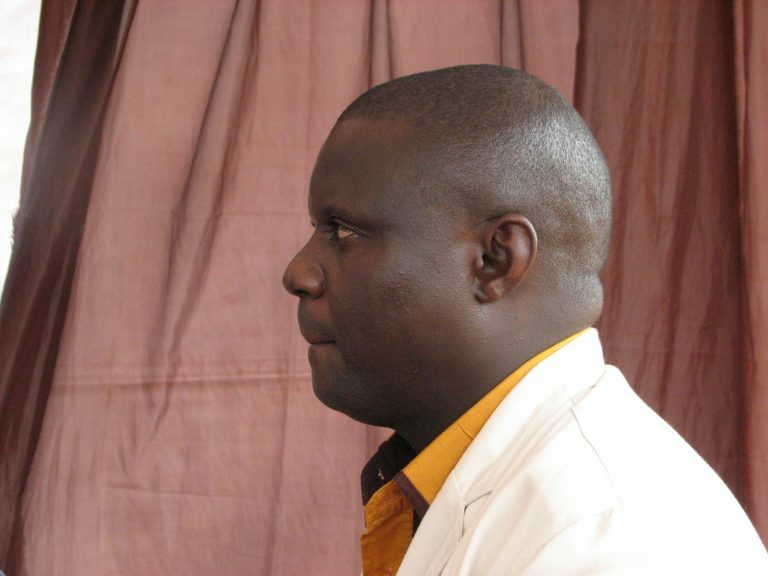 Many of the midwives on the front lines in poor communities work far from clinics and hospitals, and he was able to provide training to help these health care workers. Mr. Vega said he shares Dr. Hall's vision of using social entrepreneurship to transform the nation's health care system and dreams of following in Dr. Hall's footsteps. 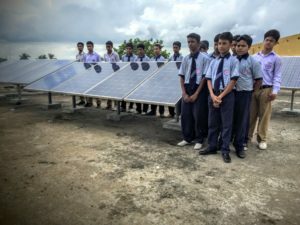 INDIAN SCHOOLBOYS STAND NEXT TO ONERGY'S MICRO-GRID SOLAR PANELS. Central America doesn’t rank as the most active geographic region for social entrepreneurship and impact investing. Yet, as the social enterprise movement becomes more mainstream, it is reaching all parts of the globe. With Central American civil wars from the 1980s having been replaced with entrenched gang violence, it is a region worth understanding and supporting. 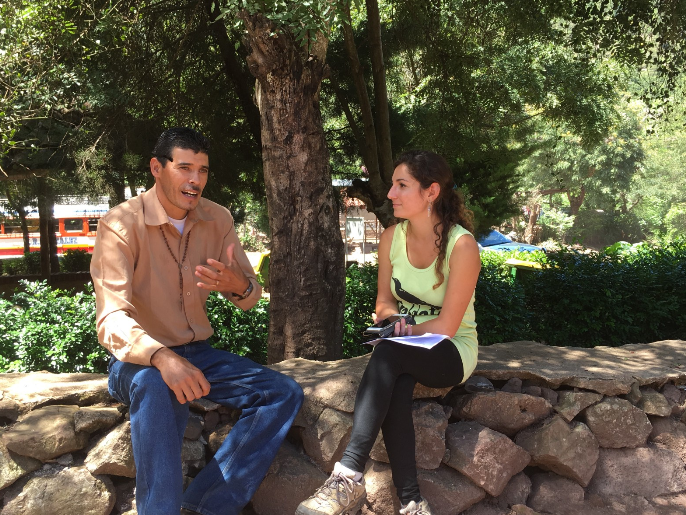 In this conversation, Andy Lieberman, Director of New Programs at Miller Center for Social Entrepreneurship, shares his insights about social entrepreneurship in Central America. How does Central America compare with other regions of the world where Miller Center for Social Entrepreneurship works? AL: For various reasons, Central America has lagged behind other developing regions of the world in both social enterprises and impact investing, but it’s an up-and-coming locale. We’re talking about seven countries with a combined population of 42 million people. Expanding to include the Caribbean, the population doubles to 84 million. India, Nigeria, and Mexico are examples of countries that each have populations far larger than all of Central America and the Caribbean, so it is not surprising that those more populated countries are further along in social entrepreneurship. Being a laggard presents some exciting opportunities for Central America to leapfrog ahead. What are those opportunities and how could Central America leapfrog other countries? AL: The disadvantage of more well-developed infrastructures is that they can have a kind of gravity, an inertia that makes big leaps forward more difficult. To take an often-cited example from the technology world, countries that lacked robust wired telecommunications infrastructures when cell phones became popular were able to jump directly into widespread cell phone adoption. They were able to leapfrog the more-developed United States and much of Europe in cell phone use because they didn’t have to face the “conversion baggage” of an entrenched wired telecommunications infrastructure. Examples of this kind of leap-frogging in social enterprise include leveraging tablets, mobile data, and cloud-based services to provide better services at lower costs without the large upfront investment that used to be necessary for a technology-based enterprise. In a similar fashion, Central America’s less-developed social entrepreneurship infrastructure leaves more room for the region to embrace approaches already proven elsewhere in the world. These proven models can be adapt to the local context, which is much faster than developing a new model from scratch. You’re just back from the Central American edition of the Latin American Impact Investing Conference (FLII). What were your biggest takeaways from FLII? AL: The potential and the momentum for social entrepreneurship and impact investing in Central America were undeniable. There was a consensus that the time is right for Central America to move from a reliance on development through NGOs and international donors to a new model based on social enterprises and impact investments. It was also the first conference I’ve been to where I felt old! It seemed like everyone was under 30. Not only were the energy and optimism of the young FLII attendees contagious, but also I was blown away by how smart and well prepared they were. It’s a cliché to say that young people are tech-savvy, but it is worth pointing out how seamlessly these new social entrepreneurs are integrating technology into their business models. Tell us about some of the social enterprises that Miller Center has worked with in Central America. AL: As the ecosystem has evolved, so have the companies we’ve worked with. In the early days of the Global Social Benefit Institute (GSBI), we had the privilege of working with groups such as Byoearth, which helps women’s groups to start vermiculture (composting with earthworms) businesses. We are now seeing new social enterprises such as Solubrite bringing proven energy access technologies and business models such as pay-as-you-go solar home systems to Central America, including Nicaragua and Panama. It was also nice to see Audra Renyi of World Wide Hearing at the conference — her company distributes low-cost hearing aids, and Guatemala is one of her focus countries. Is impact capital available to these enterprises? AL: Impact capital is always available to good social entrepreneurs who present a truly justifiable ask. However, with a few notable exceptions such as Pomona Impact, the region lacks a strong network of impact investors. As a result, Central American social enterprises need to source most of their capital from outside the region. I was pleased to see organizations including Acumen Fund and the Inter-American Development Bank at the conference engaging with the entrepreneurs. You lived in Guatemala for a number of years. What’s changed since you were there? AL: When I was teaching in rural Guatemala in the ’90s, the civil war was winding down, but it was still very much a factor that impeded any kind of progress. Once the peace agreements were signed in 1996, a whole wave of international aid began that lasted about a decade. That aid created many short-term gains, such as enabling many people to get a better education, building a strong NGO sector, and creating some rural prosperity through infrastructure and income-generating projects. However, in the early 2000’s, the world’s attention turned to other hot spots such as Iraq, Afghanistan, and Darfur. Consequently, global aid organizations shifted their priorities, attention, and money to those parts of the world. When this happened, they left a gap in resources and options in Guatemala and throughout Central America. Even so, some projects were able to build in mechanisms to persist. For example, the educational technology project I ran under USAID funding in the early 2000s was able to continue its impact by converting itself into a social enterprise. It is still running with an all-Guatemalan team, but it doesn’t have the national platform it had under the USAID banner. Who else is Miller Center partnering with in Central America? AL: Our go-to partner for the region is Alterna Impact, a social enterprise support organization that organized the FLII conference. They are only six years old, but they have already built a huge following and are leaders in the region. Of course, we also work with the local Jesuit universities. I’ve had the chance to work with faculty and program leads in Guatemala, El Salvador, and Nicaragua, and they are getting into the social enterprise space and see it as a synergistic way to combine their social missions with their efforts in entrepreneurship. We also have interesting NGO partners such as ASDENIC in Nicaragua. This summer, through our Global Social Benefit Fellowship (GSBF) program, Santa Clara University students worked with ASDENIC on market analysis for social enterprises in the area of improving access to safe drinking water. Where do you think social entrepreneurship in Central America will stand in 10 years? AL: Progress is seldom as fast as we would like, but I expect to see a mature sector, where young people are aspiring to careers in social entrepreneurship straight out of school; where mid-career professionals are launching or mentoring social enterprises as a way to give back; where impact capital is better understood and more available; and where the ecosystem of NGOs and government agencies see social enterprises as strategic partners to help scale and sustain their programs. THE FACULTY AND STAFF OF UNIVERSITY OF SAN CARLOS AND SANTA CLARA UNIVERSITY OF CALIFORNIA, WITH REPRESENTATIVES FROM RAFI, AFTER THEIR DISCUSSION ON PROPOSING A COMMUNITY-BASED MICROENTREPRENEURSHIP WHICH COULD HELP ALLEVIATING POVERTY IN REGION 7. Santa Clara University of California has collaborated with the School of Business and Economics of the University of San Carlos (USC) and the Ramon Aboitiz Foundation Inc. (RAFI) to design and implement programs that will helping sustain and improve micro-entrepreneurs in Cebu, with the purpose of alleviating poverty in the area. Fr. Michael Engh of Santa Clara University said they are impressed with the practicality of USC’s current microentrepreneur-focused programs, and that they are giving their full-support on implementing the project. The said academic-collaboration will be a community-based program wherein students, faculty and alumni of the economics and business departments of USC and Santa Clara University will participate on helping and sustaining micro-entrepreneurs around Cebu. USC University President Fr. Dionisio Miranda said they invited representatives from Santa Clara University to discuss with them how community extensions of microentrepreneur programs in California in the United States of America can be used to aid the improvement of microentrepreneurship in Cebu, and ultimately “alleviate the poverty situation”. “Their programs serve as benchmarks on how to further sustain microentrepreneurship,” added Miranda. In addition, the dean of USC’s School of Business and Economics, Dr. Challoner Matero, said their department, together with RAFI, will do extensive research to make sure that the microentrepeneurship program from Santa Clara University, which are designed for a first-world country, will be applicable for a third-world country like the Philippines. The team will also research on the poverty situation in Cebu before launching the project. Leaders in social entrepreneurship, from Miller Center, Skoll, Toniic, Acumen and more, take stock of 2016, look ahead to 2017. The cusp of the new year naturally prompts reflection about the past and speculation about the future. Miller Center for Social Entrepreneurship invited some leaders in social entrepreneurship and impact investing to share their thoughts about the current state of the sector and some trends they see for 2017 and beyond. “As social entrepreneurship evolves, we need to continually be creative about how we address our ultimate goal, which doesn’t change—and that’s to discover the best ways to help social enterprises worldwide collectively lift billions of people out of poverty,” said Thane Kreiner, Ph.D., executive director, Miller Center for Social Entrepreneurship at Santa Clara University. One of the big challenges is how to measure the impact of social enterprises on the communities they serve, as well as how to attribute what factors lead to particular outcomes. “Is social entrepreneurship really making a dent in the big problems facing the world today? 2017 would be a good time to talk about this,” said Harvey Koh, managing director of FSG. On the other hand, Lisa Kleissner, co-founder of KL Felicitas Foundation, observed that the notion of impact washing became more prevalent in 2016. Impact washing is when a company or organization spends more time and money claiming to be “impactful” through advertising and marketing than actually implementing business practices or producing investable products that truly deliver positive social and environmental impact. “To avoid impact washing, impact networks such as Toniic become so much more important—to provide clarity on what is and what is not impact,” she said. One of the “goal posts” that Miller Center and others have identified for benchmarking the impact of social enterprises are the United Nation’s 17 Sustainable Development Goals (SDGs). The SDGs, which celebrated their one-year anniversary in 2016, provide specific goals for ending poverty, protecting the planet, and ensuring prosperity and well-being for all. As an example of these trends in impact investing, Woo described a CRS partnership with USAID to develop a fund that will make grants and loans to community organizations in Guatemala’s Western Highlands. This fund will be paired with technical support for communities to develop robust, inclusive development plans and projects—and it will be augmented by $50 million of additional public and private support for the target communities. KL Felicitas Foundation’s Kleissner noted that 2016 saw “a remarkable uptick across the ecosystem in the increase of financial product offerings, impact intermediaries and new capital moving in. Impact investing definitely arrived in 2016,” she said. To help explore new ways to address the funding of social enterprises, particularly as they scale, Miller Center has identified the “Transformative Frontier,” which spans the entire investment spectrum from approaches focused purely on investment returns to pure philanthropy. One potential avenue for making investment in social enterprises less risky, while creating pools of talent to expand the reach of social entrepreneurship, is to replicate validated social enterprise technology solutions and business models. “We see strong potential in efforts to scale tried and tested models, while reaching deeper into the strongest pools of entrepreneurial talent. That would be great for accelerating impact, and it should also be interesting for investors,” said FSG’s Koh. Skoll Foundation’s Osberg highlighted the challenges to social entrepreneurship from larger cultural issues: “Knowing the imperative for innovative solutions to preserve the future of democracy and free enterprise, those stakes raise the ante for social entrepreneurship. If social entrepreneurs are to fulfill the promise of their innovative solutions to social challenges, then more social entrepreneurs must be able to demonstrate results at scale, and more investors must be willing to make bigger and more sustainable bets. FSG’s Koh emphasized that “we need to move into systems thinking, which is a departure from the impact enterprise approach. As we push to overcome barriers, we realize that what’s needed is bigger than working with just the social enterprises. It also includes governments, societies and other pieces that are part of larger systems. “In my mind, the only effective path forward for social entrepreneurship is through collective action that achieves collective impact: identifying and replicating lots of similar innovations, while aggregating a full range of capital and applying it intelligently so that all the efforts add up to making a huge difference,” said Miller Center’s Kreiner. Miller Center is a pioneer and leader in this field, having started its Global Social Benefit Institute (GSBI®) social enterprise accelerator programs at about the same time the Skoll Foundation was founded and that Acumen was launched. “Successful trailblazers see where to go before others know the path,” said Kreiner. “Miller Center has embarked on a number of experiments in replication, new capital approaches, and building a network to spark greater collective efforts across the entire ecosystem. Our hope is that this experimentation, along with thoughtful analysis and continued conversations, will lead to best practices that can be applied to communities in need.